This hill sheep produces a lovely fleece with a delicate crimp that can make a fine soft yarn or a springy rougher yarn. 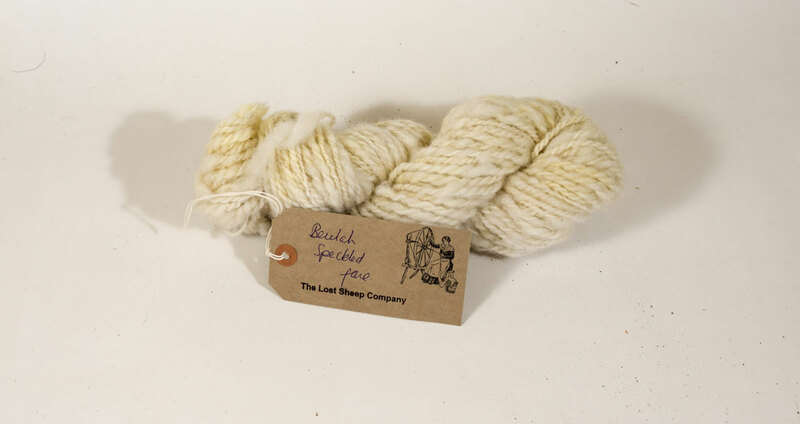 The muddy fleece can be a surprise because after scouring produces a very white yarn with great stitch definition. Being so white it is ideal for dyeing with bright clean colours. Beulah sheep are named after a hilly area in Wales, the longer version being Eppnt Hill and Beulah Speckled Face sheep. Native to Wales and no history of having been cross bred. A joy to spin with siky open locks, for fine ,or lofty yarn that dyes well. 50 grams of Handspun Beulah Yarn. This hill sheep produces a lovely fleece with a delicate crimp that can make a fine soft yarn or a springy rougher yarn. The muddy fleece can be a surprise because after scouring produces a very white yarn with great stitch definition. Being so white it is ideal for dyeing with bright clean colours. Beulah sheep are named after a hilly area in Wales, the longer version being Eppnt Hill and Beulah Speckled Face sheep. Native to Wales and no history of having been cross bred. A joy to spin with silky open locks, for fine ,or lofty yarn that dyes well.